Plant weigela shrubs as a border plant around the foundation of your home or as a stand alone showpiece in your yard or garden. Weigela shrubs can grow up to 6 feet tall and have purplish green to variegated green foliage. These beauties have a profusion of tubular shaped flowers in shades of red, pink and white, beginning in June and lasting through most of the summer. Weigela flowers attract hummingbirds and butterflies to your property, but other pesky insects aren’t very interested in weigela leaves, so you’ll rarely need to concern yourself with insecticides for this showy shrub. Select a sunny location to plant your weigela shrub. The soil should also be rich and drain well. If water is still standing after four to five hours, the soil does not drain well. Dig a hole that is twice as wide as the container housing the weigela shrub. The hole should be as deep as the container. Add 2 to 3 inches of sandy potting soil to the bottom of the hole. Weigela prefers a sandy mixture to clay. Add water to the hole so that the sandy potting soil is moistened. Release the weigela from the plastic grower’s container. It is likely that the shrub will not lift out easily due to the root system. You can cut the sides of the container with scissor to free the weigela without harm. Knead the roots at the base of the shrub to wake them up. This will help your weigela shrub to become established in the ground. Set the shrub into the hole. The base of the shrub and the top of the root ball should be slightly above ground level. If the root ball is sitting below ground level, add more sandy potting soil to elevate the shrub. Fill in around the weigela shrub with more of the sandy potting soil until the weigela is standing firmly straight. Water the shrub and check if the potting soil settled below the root ball. If so, add more sandy soil. Add mulch around the weigela to hold the moisture in. 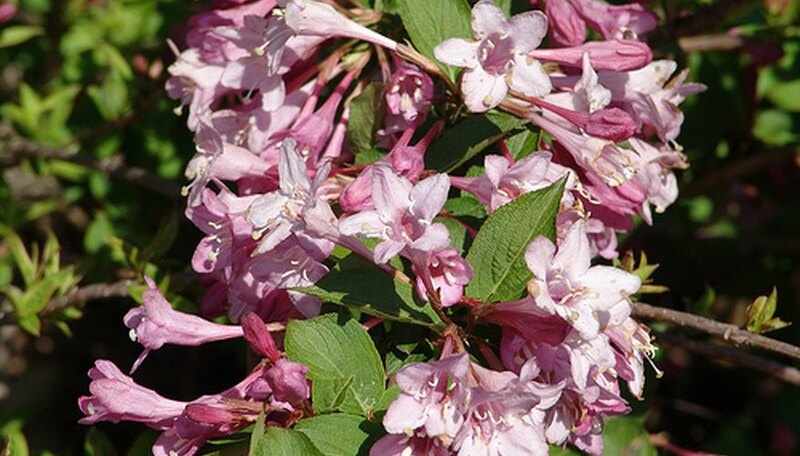 For the first two seasons, make sure that the weigela has adequate moisture. After the shrub is established, it will do well on its own. Check with the nursery where you purchased your weigela shrub to determine when you may need to add fertilizer. If the shrub has been recently fertilized, you will not need to add more until the following spring.